Explore the 1,000 acre Saddlerock Ranch and vineyard in Malibu. Your trusty guide and driver team will lead the adventure on custom-built open-air Safari vehicles. You'll make stops along the way to take in the scenery, taste local wines, and get up close and personal with animals you never knew were Angelinos too: zebras, camels, alpacas, bison, and even Stanley the Giraffe - all just 30 minutes from LA. From Bisous to Zinfandel, we have the wines to make your palette scream for more. All of our wines are sourced from local vineyards, featuring the tastes and flavors of the casual wine-making culture alive in the Santa Monica Mountains. Many of our exotics came to Saddlerock Ranch to retire after successful careers in Hollywood. Meet them in person and up close! From Timon and Pumba to Speeder and Shui, everyone on the Ranch welcomes you with open hooves. This is assuming you have a healthy handful of carrots, pellets, or bananas (provided). What's the only thing better than one wine tasting? That's right... Two wine tastings. 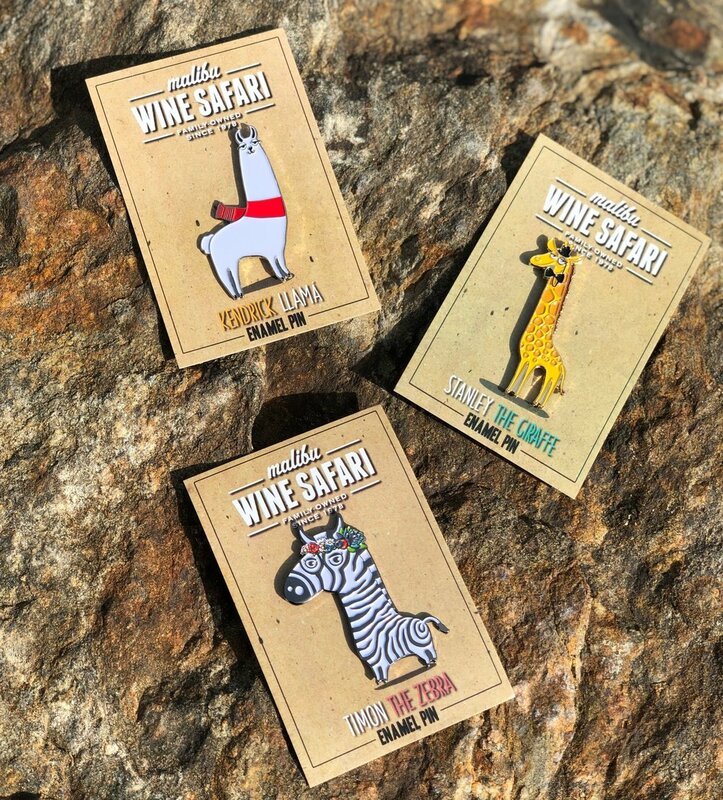 Try six different local wines on your safari through the ranch. Commemorate your visit and bring the safari home with you. Featuring a selection of carefully curated and unique items from and inspired by Malibu Wine Safari. If you can’t visit us in person we offer a selection of our unique items online as well. What to do After the safari? hit the Malibu Wines tasting room! And, tell all of your friends - of course! You'll be the trendsetter for sharing the secret of Malibu Wine Safaris. Boom. Look at you, getting cooler.